Both [Manny Ramirez and Joe Torre] agree that something will be done. What they can’t seem to agree on is what will be done, when or by whom. “We’re going to talk again later,” Torre said yesterday. And yet the manager was adamant when asked if maybe Ramirez was using his distinctive hairdo — which last night was adorned with a single green, yellow and red Rastafarian dread right in the middle — to test the new manager’s authority by continuing to stonewall the request. A deal has apparently been struck, though, with Fantastic Sam’s, Ramirez getting it cut sometime this week and a Dodgers charity benefiting. Hair today, and maybe gone tomorrow, and it’s all anyone wants to talk about. 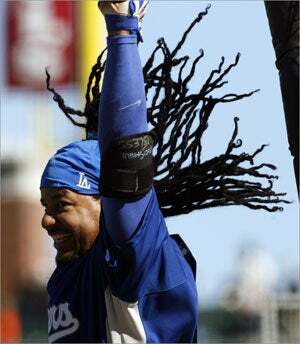 It was the return to Dodger Stadium for Ramirez, a week after electrifying the place. Fans arriving at the stadium eager to be a part of Manny Mania, though, were surprised to learn the dreadlock bandannas they had heard about had not arrived yet. Simers also has Manny commenting on the controversial fine he received from the Red Sox for shoving traveling secretary Jack McCormick back in June. Ramirez stopped by to say he had been fined $40,000 for “that incident,” the one where he had pushed the Red Sox traveling secretary a few months back. When a player is fined, the money is donated to charity, and Ramirez said he was going to divide it four ways — $10,000 going to Mattel’s. I suggested next time he get in the kind of trouble that might draw a larger fine, and from the look on his face, he has some ideas. I don’t think arriving late to the field in the ninth — shirt unbuttoned and apparently thinking he’d been removed from the game — was one of them. The Boston Globe reported last month that Ramirez was fined between $10,000 and $15,000 for the altercation. The ninth inning was about to start and left field was empty. Manny Ramirez was missing. Let’s see, there’s no Green Monster for him to hide in at Dodger Stadium — so where in the world was Manny now? In the dugout, several Dodgers peered down the tunnel toward their clubhouse as Monday night’s game against Philadelphia was held up. They looked as though they didn’t know whether to laugh, scream or simply shake their heads. Then, finally, the enigmatic slugger reappeared and jogged swiftly out to his position, dreadlocks dangling and a wry half-smile on his face. This time, there was a plausible explanation — sort of — for Ramirez’s brief but conspicuous absence: He thought he had been pulled from the game. People in high places in baseball are starting to speculate about whether this could be the last season together for the highly successful yet increasingly uncomfortable front-office tandem of GM Theo Epstein and president/CEO Larry Lucchino, and one logical ending would have Lucchino joining Manny Ramirez in Los Angeles. It’s all speculation now, but it’s not all that farfetched. Despite the well-documented difficulties and differences of Epstein and Lucchino — Lucchino is said by people familiar with the just-departed Ramirez soap opera to have been much more committed to keeping Ramirez, no matter how badly the man-child superstar behaved and how much he risked undermining the clubhouse — the two innovative Yalies have engineered this Red Sox renaissance and combined to bring two World Series titles to the previously star-crossed and storied organization. Yet there is burgeoning talk among baseball’s elite that the end of their baseball relationship could be at hand. Lucchino denied any interest in leaving Boston or the Red Sox in an e-mail to Boston sports radio station WEEI today. Check out our updated photo gallery of Manny being Manny moments here.